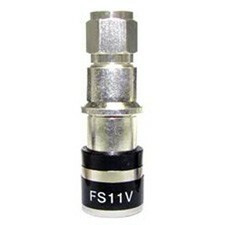 RG11 Compression Connectors are used in CATV, broadcast and commercial industries. Universal 7/16" nut eliminates extra installation tools. Use the Cable Pro PS11 cable strip tool to prep RG11 connectors. 30% more threads create a secure, weather-tight termination and increased pull-out strength. One-piece design simplifies installation.